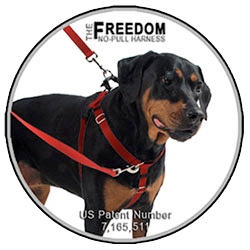 This page will explain the various leashes that have two connections to be used with Freedom No Pull Harness. The two most popular training leashes are the 4-configuration and the 10-configuration. Both leashes have a single floating handle and a connection on either end so you can clip to the front and back of the harness simultaneously or just the back. The 4-configuration is 3' when connected to the front and back and the 10-configuration is 4.5' when connected to the front and back. So the 10-configuration is 1.5' longer than the 4-configuration. Most people select the 4-configuration because it is shorter and keeps the dog really close. I find that people who are taller or like the dog to have more space in front prefer the 10-configuration leash. (2) Connect the Traffic Handle to the stationary ring at end of leash and use it as an 8' leash. (3) Fold leash in half. Clip one end of leash to your dog and the other end to the stationary ring. Clip the Trafffic Handle to the floating ring. This makes a 4' lead. (4) To create a 2 foot leash, continue from step two, slide the floating o-ring towards you and reconnect it to the bolt snap that is connected to your dog's collar. (5) Place lead around shoulder/back and clip (1) end to floating ring and other end to dog. This makes a hands free lead. (6) Place lead around waist and clip (1) end to floating ring and other end to dog. This makes a hands free lead. (7) To create a temporary 7 foot tie-out, simply attach leash to your dog and wrap the handle end of leash around a pole, fence post, railing or small tree and attach both snaps in the handle to the floating o-ring. (8) To create a temporary 4 foot tie-out, repeat step 4 and attach bolt snap in the handle to the fixed o-ring at the base of your leash. (9) Leash and Collar Combo- Us it as a temporary leash and collar. Slide the black washer lock all the way down to the bolt snap, attach the same bolt snap to the floating o-ring, creating a loop. Slip the loop over your dog's head , pull slightly as to gather excess and use it as a slip lead to get your dog home safely. (10) Walk two dogs at once. Attach the bolt snap in handle of your leash to one dog, attach the other bolt snap to your other dog. Connect the traffic Handle to the floating ring. The Marine Dog Leash is a rope style leash. It is available in a thinner rope of 3/16" diameter for dogs under 40 lbs, or 5/8" wide for dogs over 40lbs. Marine Dog Leashes are made by hand using a double-braided nylon design rope found only in the boating industry. The rope is made to resist kinking, elongation and has an excellent resistance towards abrasion. The hardware is a strong bronze that resists rust, chips and pitting. This is a favorite leash of mine as the 5/8" diameter braided rope is comfortable in my hands. HOWEVER, The Marine Dog leash for big dogs is a heavy, solid leash due to the hardware fittings, and 8' length. Step 1: Connect the bolt snap to your dog's collar or harness and use it as an 8 foot leash. Step 2: Connect the bolt snap in the handle to the O-ring at the base of the leash to create a 4 foot leash. Step 3: To create a 2 foot leash, continue from step two, slide the floating o-ring towards you and reconnect it to the bolt snap that is connected to your dog's collar. Step 4: To create a temporary 7 foot tie-out, simply attach leash to your dog and wrap the handle end of leash around a pole, fence post, railing or small tree and attach both snaps in the handle to the floating o-ring. Step 5: To create a temporary 4 foot tie-out, repeat step 4 and attach bolt snap in the handle to the fixed o-ring at the base of your leash. Step 6: Hands Free-Around Your Waist. Attach leash to your dog, wrap handle side of leash around your waist. Connect bolt snap in handle to floating 0-ring and slide the black washer lock towards yourself until it is snug to your comfort. Step 7: Hands Free- Over the Shoulder. Attach the handle side of leash to your dog. Place the leash under your left arm and wrap it over your right shoulder and connect the bolt snap to the floating o-ring. Adjust the black washer lock to suit your comfort. Use the handle by your dog's collar for extra control. Step 8: Leash and Collar Combo- Us it as a temporary leash and collar in case your dog's collar or harness should break while walking your dog. Slide the black washer lock all the way down to the bolt snap, attach the same bolt snap to the floating o-ring, creating a loop. Slip the loop over your dog's head , pull slightly as to gather excess and use it as a slip lead to get your dog home safely. Step 9: Walk two dogs at once with no tangles. Attach the bolt snap in handle of your leash to one dog, attach the other bolt snap to your other dog, slide the floating o-ring up towards the center of the leash and connect our Marine Dog Healing Lead (Sold Separately) to it. Remember to attach your larger dog to the side of the leash opposite the black washer lock as to give your smaller dog his or her own space. Step 10: Healing lead can be used all by itself to keep your dog very close to you. Step 11: Storage of Leash- When your dog or dogs are off lead, you can easily hand the Marine Dog leash System to your belt loop. Turn the leash into a 2 foot leash as in Step 3, attach the healing lead to the fixed o-ring, attach the bolt snap, which normally attaches to your dog, to your belt loop instead. Your pockets were made to keep your hands warm, not to stuff a leash in it. For those that can't live without the soft comfortable feel of leather, this leash is for you. As with all leather leash products, this leash starts out rigid and through use it becomes soft and supple. If the Marine Dog Leash is too heavy, then this is the perfect solution. Constructed from climbing rope, this leash features hardware and clips that not as bulky as the Marine Dog. This leash can be configured in many of the same ways as the Marine Dog. However, instead of having a sliding stopper, you tie off the leash at various points to create the lengths and configurations you want.